Everybody knows you have to accept corporate money and work within the two-party system to get elected, right? Not so with Kshama Sawant. In November 2013, nearly 100,000 voters elected her to Seattle City Council – as an open Socialist – and she didn’t take a dime in corporate cash! In a huge political upset, Sawant’s victory sent shockwaves through the political establishment and even around the globe. Sawant is the first independent Socialist elected in a major U.S. city in decades. Her historic breakthrough was covered by every major newspaper in the country, major TV stations, and newspapers around the world. Now she and her Socialist Alternative political party are leading a movement to implement their main campaign pledge: raising Seattle’s minimum wage to the highest in the country – $15/hour – and the movement is spreading nationally. How did Sawant and Socialist Alternative succeed in unseating a well-connected, 16-year incumbent Democrat? Is Seattle just a mecca of progressive politics? Sounds nice. But is she dreaming? The success of other progressives in November 2013 suggests that Sawant’s statement above isn’t just a dream. Democratic candidate Bill de Blasio was elected by a landslide as New York City’s mayor by promising to fight inequality and racist police brutality – much like Sawant, although he is by no means a Socialist. Ty Moore, another Socialist Alternative candidate, ran for Minneapolis City Council and came within just 230 votes of being elected. The labor movement in Lorain County, Ohio got fed up with the Democrats’ betrayals and succeeded in electing two dozen “independent labor” candidates (though some maintained ties with the Democratic Party). A new study found that the richest 1% captured 95% of the income gains of the economic “recovery” in the U.S. while working-class people saw their incomes decline. Student debt has surpassed $1 trillion, more than the total accumulated credit card debt in the country. Meanwhile, corporate politicians continue their austerity agenda of tax breaks for corporations and the richest 1% while slashing social services and jobs for working people and the poor. In response to this growing inequality, a groundswell of resistance from working-class people keeps erupting across the globe: revolutions in the Middle East, general strikes across Europe, a labor uprising in Wisconsin, Occupy Wall Street, protests in Turkey and Brazil… It’s only a matter of time before the next mass struggle breaks out. Everyone is talking about inequality – and lots of people are eager to do something about it – but only a few activist movements in the U.S. have been able to give a popular expression to this burning desire. The Occupy Wall Street movement was extremely successful in thrusting the issue of inequality into the mainstream, but eventually the movement began dwindling with no clear way forward. As Occupy activists got drawn into the 2012 corporate-controlled elections, Socialist Alternative argued that the movement could be rebuilt by running 200 independent Occupy candidates across the country. Unfortunately, very few activists took up this call, and discussions about challenging inequality were drowned out by the corporate media, which refocused political debates around Obama, Romney, and other corporate politicians’ agendas. One exception to this trend was the tremendous response Occupy activist Kshama Sawant received in her first election campaign in 2012, when she won 29% of the vote against the Washington State House Speaker Frank Chopp, the most powerful state legislator. This demonstrated the potential that existed if Occupy had run more independent candidates. Around the same time, fast-food and Walmart workers captured people’s imaginations by organizing rolling one-day strikes across the country demanding a $15/hour minimum wage and decent working conditions. 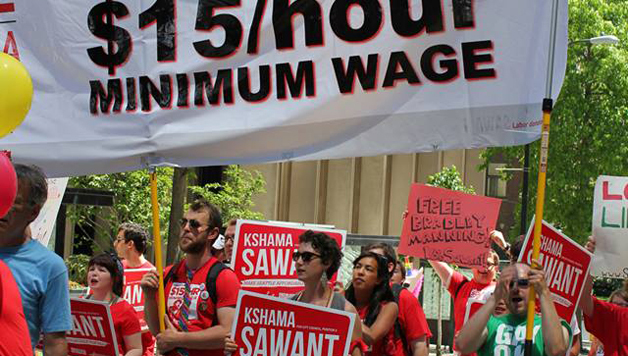 In 2013, Sawant’s next campaign linked up with the fast-food strike movement in Seattle, and we in Socialist Alternative recognized that the demand for a $15 minimum wage was gaining a tremendous resonance. After many meetings and discussions, we decided to focus our campaign around a call to “Make Seattle Affordable for All” and three specific, concrete demands: rent control and affordable housing, a tax on the super-rich to fund mass transit and education and, above all, a $15 minimum wage. Socialist Alternative used what we call “the transitional method”: We connect with the consciousness of everyday people, meet them where they are at, and then point a way forward to help social justice movements achieve victory. The transitional method also entails linking demands for basic improvements in workers’ day-to-day lives with the need for a fundamental restructuring of wealth and power in society along socialist lines. Despite universal demonization of socialism by the corporate media and the political establishment, the Sawant and Moore campaigns demonstrated that “socialism” is no longer a dirty word. Multiple polls, including a recent Gallup poll, have found that a third of Americans react positively to the idea of “socialism” – a historic increase from decades ago and a 3% increase from 2010 to 2012. Merriam-Webster declared the words “socialism” and “capitalism” together to be their Word of the Year in 2012 due to the high number of online dictionary searches for the words. The working class of the U.S. has not experienced being bitterly betrayed by Social Democratic or Communist political parties like in most other countries – parties that claimed to fight for socialism but ultimately sold out or even implemented austerity attacks on the working class. In the U.S., socialism increasingly sounds like a new attractive idea, an appealing alternative to people suffering from unemployment, low wages, and growing debt under capitalism – despite much confusion about the real meaning of socialism. Among both African Americans and young people (ages 18-29) there is now more support for “socialism” than “capitalism” – a sign of things to come. This helps explain in part why the results from both our 2012 and 2013 election campaigns revealed that the demographic groups who voted for our candidate the most were low-income voters, youth, and people of color. Our electoral campaign tapped into the disgust with the political establishment (despite widespread political confusion), and we educated people, raised class consciousness, and popularized socialist ideas. For example, Sawant popularized the idea that large corporations such as Boeing should not be run for the profit of a few people but instead should be taken into public ownership and democratically run by workers and the wider community. However, the working-class anger at corporate politics simmering beneath the surface of society would never have been expressed in Seattle and channeled in a progressive direction in 2013 if we had not taken a bold electoral initiative. That is why it is vital that labor and other progressive movements not only organize rallies, strikes, etc. but also follow Sawant and the Ohio labor movement’s example of running independent candidates. Otherwise, political discussions and debates throughout society will be controlled and limited by the two corporate parties. If working-class activists and progressive organizations do not build a strong left-wing political alternative, then the vacuum of growing anger in society will be filled either by right-wing demagogues or by populist Democrats who will attempt to contain our movements within the “safe” channels of the corporate Democratic Party. To build on the momentum of Sawant’s 29% of the vote in 2012, Socialist Alternative appealed to Occupy, labor, civil rights groups, and left-wing parties to join Sawant in running a slate of vigorous independent candidates for Seattle City Hall the following year. Unfortunately, they failed to see the opportunity that existed, declined our requests, and many continued to bang their heads against the wall of the Democratic Party. In Minnesota, in contrast, the state council of SEIU unions not only endorsed Ty Moore’s Socialist Alternative campaign but contributed considerable financial and human resources. If more unions and progressive organizations would direct their resources to run and/or support independent candidates like this, there is no doubt we could run many successful campaigns and begin to build a new political party of the 99%. Sawant’s tremendous impact demonstrates how candidates and a political leadership are absolutely necessary to give a visible expression to the underlying anger and desire for change in society – and to channel that discontent around a clear agenda. The Seattle labor and progressive organizations’ failure to recognize the huge opportunity they would miss by not participating in a coalition slate of independent candidates with Sawant largely stems from their lack of a class struggle, socialist perspective. Many on the left blame the country’s conservatism on the confused consciousness of working-class people, often underestimating ordinary people’s desire for progressive change. Marxists realize that there is a lot of political confusion among the working class, but we identify the source of the country’s political conservatism in the ruling class and its media and political and cultural institutions. Marxists believe that the majority of the working class wants progressive change but that workers need fighting organizations and a political party to educate people and to harness and express the working class’s latent power. The missing ingredient in building a progressive movement is not primarily workers’ consciousness, but rather the lack of a political leadership that can give voice to workers’ interests. We believe that a workers’ party and independent candidates will play an invaluable role in shifting the whole terms of debate, debunking the propaganda of the ruling elite, and educating workers about their real interests. We can already see how much having Kshama Sawant in office has been able to shift the Seattle political debate, and to some extent the national political debate, in favor of raising the minimum wage to $15/hour. How much more could be accomplished if we had hundreds of independent candidates and our own mass party fighting for workers and exposing the Republicans’ and Democrats’ corporate agenda? A new political party of workers, people of color, women, and environmentalists would shift the whole terms of debate in the country, unite various movements together, and significantly raise workers’ consciousness about our real interests. Despite the Citizens United Supreme Court ruling that legalized unlimited corporate spending on election campaigns, the Sawant, Moore, and Ohio labor campaigns shattered the myth that candidates have to accept corporate money to run for office. When more labor, civil rights, and environmental organizations sever their ties with the Democratic Party and fund independent candidates, there is no question we can definitely build a mass political alternative. Building such a party is an absolutely essential task today. Many progressive activists have argued that building a party such as Socialist Alternative is sectarian and a “distraction” from building a broader movement. Although Socialist Alternative is still a small, though rapidly growing, Marxist organization, it’s clear that Sawant would not have won if we had not built up our socialist organization in the years before 2013. It was Socialist Alternative’s political analysis that enabled us to identify the opportunity that existed for independent left-wing candidates. And it was only the existence of our activist organization that allowed us to implement our tactic and test out this perspective in practice. Without an organization, our analysis and ideas would have remained untested, and a historic opportunity for the left would have been lost. While the Sawant campaign relied on much broader forces than Socialist Alternative alone, Socialist Alternative served as the backbone of the campaign, politically and organizationally. Without an organized core of experienced, dedicated Socialist activists, it would not have been possible to organize a grassroots campaign of approximately 450 volunteers and pull together a broader alliance of The Stranger newspaper, six union locals, civil rights organizations, immigrant organizations, progressive parties, and many others. Sawant definitely could not have won if we had not spent years in advance building Socialist Alternative in spite of all the nay-sayers telling us we were utopian dreamers wasting our time. Against all odds, we swam against the stream and painstakingly built our organization practically from scratch. For years, we organized and educated workers and young people around Karl Marx’s ideas that the capitalist system is wracked by crises and increasingly unable to meet the basic needs of ordinary people, and that the working class is the revolutionary force which can build a new society. In addition, we benefited immensely from the contemporary Marxist perspectives, ideas, and experience of the Committee for a Workers International, a Socialist organization in over 45 countries around the world. Another lesson from Sawant’s success is that the majority of people don’t want bland moderate candidates who compromise with big business. Most people are dying to see something different, a political leadership that will stand firm against the corporate onslaught. The Green Party has run some good left-wing candidates, but when third parties run middle-of-the-road candidates who are only marginally different from the corrupt establishment, they really limit their appeal. Sawant’s popularity stemmed from her relentless attacks on the Republican and especially the Democratic politicians as tools of big business. Sawant’s pledge to live on only the average worker’s wage and donate the rest of her salary to building social justice movements made her stand out. Sawant did not try to appeal to both the left and the right; she did not try to straddle the fence between the working class and the ruling elite; she stood completely on the side of the working class. And she inspired tremendous enthusiasm by not pulling any punches and arguing boldly (though also tactfully) for her principles. We based our campaign on the logic of the class struggle. We did not moderate our demands to make them appear reasonable and acceptable to the corporate elite or upper-middle class professionals. Rather, we fought for far-reaching reforms that spoke to the day-to-day needs of working-class people, even though it would put us in conflict with the corporate political establishment. Workers who are busy working and commuting will not make time to volunteer for a campaign that is not going to make a real difference in their lives. But approximately 450 people were inspired to volunteer thousands of hours to the Sawant campaign because we were fighting for concrete reforms like a $15/hour minimum wage that would dramatically improve their lives. While our campaign argued clearly that progressive social change won’t be initiated by either Republicans or Democrats, we also took a non-sectarian approach to voters who supported Sawant but had not yet fully broken with the Democratic Party. We welcomed many activists who were excited to volunteer for our campaign but were also volunteering for Democrats in other races. In October 2013, a group even formed called “Democrats for Sawant,” expressing rank-and-file Democrats’ discontent with their party leadership. Unlike some ultra-left radicals, we did not put up artificial barriers that would obstruct people beginning to move in a positive direction from getting involved with the Sawant campaign. As long as people supported our core demands and our candidate who persistently critiqued the Democratic Party and capitalism, we welcomed their support. We worked together with these activists to build the Sawant campaign while also selling them our newspaper and pamphlets and trying to convince them to break with the Democratic Party and capitalism. But crucially, we used a friendly, patient tone to discuss our ideas with them. A condescending, impatient attitude would have been counterproductive. At the same time, we did not opportunistically bend to the intense pressure to lower our Socialist banner or endorse Democratic candidates. We used our campaign to consistently advocate for the formation of a new independent party of the 99% and for democratic socialism. This principled yet skillful approach was essential for convincing a number of unions to endorse our campaign. At first, practically all the labor leaders dismissed our electoral campaigns and endorsed our Democratic opponents – Frank Chopp in 2012 and Richard Conlin in 2013. But eventually our transitional approach and our bold class appeal kept winning more and more support among rank-and-file union activists. By October 2013, we experienced a surge in support for our campaign and won a strong majority for an endorsement in the King County Labor Council. Unfortunately, the 28 to 21 vote fell just shy of the two-thirds required for a formal endorsement. We could not have won without taking a bold, serious approach to fundraising. Richard Conlin raised $242,000, and we built a powerful war chest of $141,000, over half of what Conlin raised. Yet our donations were overwhelmingly from working-class people and activists – 1,400 donors with a median donation of only $40. Without these donations, we could not have afforded crucial necessities such as 50,000 glossy professional handbills, 140,000 mailers, five banners, robocalls, a few newspaper ads, and over a dozen organizers. Our campaign inspired around 450 volunteers throughout 2013 to blanket the city with 7,000 posters and 1,350 yard signs and to knock on over 17,000 doors. We phone-banked thousands of voters, set up literature tables at farmer’s markets, and participated in protests and parades. Our staff also worked tirelessly, gaining broad attention with around 150 media articles throughout the campaign. We were extremely fortunate to have the support of The Stranger, a liberal weekly which is the second-largest newspaper in Seattle. The Stranger had gotten fed up with the inequality created by the Great Recession and the complicity of the Democratic Party establishment in aggravating the social crisis (for example, by slashing $10.5 billion from education and social services in Washington state, while handing corporations $6.5 billion in tax breaks every year). They made the unusual decision to use their influential liberal newspaper to publish story after story promoting a radical Socialist challenger in hopes of tilting the balance of local politics away from corporate interests for once. This doesn’t mean independent working-class candidates cannot run successful campaigns without a major corporate media outlet on our side. The labor, civil rights, and environmental organizations have plenty of money and resources to build our own independent mass media – our own TV stations, radio shows, and newspapers. The key task is to build support within these mass organizations to break with the submissive approach to politics, i.e. supporting the Democratic Party at all costs, and instead commit resources to building our own independent mass media and independent electoral campaigns. The support from The Stranger and liberal voters who make up the majority of Seattle’s population was partially due to our strategic approach of carefully selecting which seat to run for. A major factor in our success was selecting races both in 2012 and 2013 where there would likely be only one, or at most two, other opponents, and especially no Republican in the race. This prevented Democrats from scaring people into voting for “the lesser of two evils” because there was no Republican in our particular race that liberal voters might fear. (In most urban areas, the Democratic Party has a monopoly over local politics, so other independent candidates can definitely find similar races to run in across the country, though it is worth running even if there are Republicans in the race.) In both 2012 and 2013 we also chose to run against incumbents who had been in office for at least 16 years – plenty of time to expose their corporate connections and anger their working-class supporters. Last but not least, we had Kshama Sawant – an intelligent, eloquent, passionate yet tactful, immigrant woman of color, running against stale, establishment, white guys in both 2012 and 2013. Sawant is an impressive speaker and a determined fighter, no doubt. But she is also an ordinary person who happened to attend a couple public forums in 2008 and was impressed with Socialist Alternative’s political clarity. Through discussions with Socialist Alternative, she decided to dedicate her life to fighting for a socialist world. Most ordinary people gravely underestimate our own potential to play a role in changing the world. We should follow Sawant’s shining example and commit ourselves to this cause for which there is no greater reward. Nothing in life is more meaningful than fighting alongside other working-class people to end inequality, oppression, and environmental devastation.